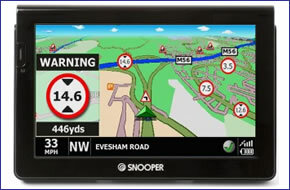 Snooper S7000 Ventura Pro is a completely unique sat nav system designed specially for caravan and motorhome use. The very first unit of it's kind, Ventura allows you to input the length, width and weight of your vehicle and will then only calculate routes that are practical and safe, avoiding low bridges and narrow roads plus, where possible roads that are unsuitable for larger vehicles. Snooper S7000 Ventura Pro features the best and most up to date street level navigation for Europe from NAVTEQ, Snooper’s award winning AURA speed camera detection (via subscription), Junction view, Lane guidance, My Speed, FREE TMC traffic information, MP3 and MP4 player, Bluetooth handsfree, built-in Freeview DVB-T TV and wide 7-inch full colour touch display. Snooper S7000 Ventura has been discontinued. Accessories and spares for the Snooper S7000 Ventura can be purchased here. View the latest range of caravan/motorhome sat navs. Snooper S7000 Ventura Pro motorhome and caravan friendly sat nav features the best and most up to date street level navigation from NAVTEQ. Preloaded are street-level road maps for 37 countries in both Eastern and Western Europe, including UK, Ireland, France, Spain, Italy, Austria, Belgium, Holland, Luxembourg, Germany, Poland, Czech Republic, Romania, Slovakia, Slovenia, Montenegro and Croatia among many others. Snooper S7000 Ventura Pro incorporates a large full colour, hi-resolution 7-inch widescreen LCD screen that provides a larger, clearer view of the route ahead. Directions and speed trap alerts have been increased in size so that they can be seen at a glance. Simply navigation at it’s best. Snooper S7000 Ventura Pro also features multi-route planning, which allows you to calculate a route up to 16 different destinations and thousands of truck specific points of interest including truck stops and truck friendly fuel stations. FREE TMC traffic receiver for real-time traffic information for the route ahead, Bluetooth technology providing hands free calling and built-in DVB-T Digital 'Freeview' TV with FREE External DVB-T Antenna, Snooper’s award winning AURA speed camera detection (via subscription), Junction view, Lane guidance, My Speed, FREE TMC traffic information, MP3 and MP4 player. All neatly housed in a sleek piano black casing. Snooper S7000 Ventura Pro Europe will create a route based on the attributes of your vehicle. Input the size and weight of your vehicle and the Snooper S7000 Ventura Pro Europe will calculate a specific caravan/motorhome route. Snooper have joined forces with camping specialists ACSI to provide you with the richest campsite data available to over 8600 campsites and all stored on board Snooper S7000 Ventura Pro as standard. Simply select the country and region you want to visit then select from an indepth list of facilities you require such as campsites with swimming pools, watersports, a nearby river, by the sea and with shops, restaurants etc Snooper S7000 Ventura Pro will then do the rest. A list of campsites that match your chosen criteria will be displayed, some even include photographs so you can see the campsite first hand. Once you have selected the campsite you want to vist, Snooper S7000 Ventura Pro will route you straight there. Snooper S7000 Ventura Pro also comes preloaded with complete lists of Caravan Club campsites, Caravan Club Approved campsites plus The Camping and Caravanning Club campsites - all preloaded so that you can search and navigate straight to them via the Snooper S7000 Ventura Pro at the touch of a button! Snooper S7000 Ventura Pro also comes preloaded with motorhome specific Bordatlas approved campsites across Europe. Whether you are looking for a destination campsite for your entire holiday or camper stop for an over night stop over on route to your final destination, Snooper S7000 Ventura Pro's Bordatlas database will help you find the perfect site. Full screen images of main motorway junctions are displayed on the Snooper S7000 Ventura Pro 5-inch display in advance to help you navigate more safely. Snooper S7000 Ventura Pro features specially formulated lane guidance software provides advanced notice of which lane or lanes to use when approaching junctions for safer driving. The speed limit of nearly every road across Europe can now be clearly displayed on your Snooper S7000 Ventura Pro at all times. Choose between speed limits for cars and advisory speed limits for car and caravans or motorhomes. In addition, My Speed can also be set to alert you if you accidentally exceed the speed limit at anytime. Although Snooper S7000 Ventura Pro has clearly been designed to navigate caravans and motorhomes on safe and legal roads it also incorporates a car setting. Simply switch Snooper S7000 Ventura Pro to car mode and it will navigate you on the most effective routes for your car instead! Create and save your own bespoke routes. Use the map view to select the roads you would like to travel on or search road by road. Use 'Your route' to build your own personal, tailored routes. In addition you can also navigate by Junction number, simply search and navigate to motorway junction numbers using the updated 'Find by map' function including Junction numbers. Snooper S7000 Ventura Pro incorporates multi-route as standard. Multi-route allows you to calculate a single route around up to 16 different destinations just by adding the post codes. No stopping and starting, struggling to find each and every address, simply your full day’s travel calculated and saved in just a few seconds. Turn off the route by mistake or decide you want to go another way? Snooper S7000 Ventura Pro will automatically re-route you in seconds, getting you back on track or will find an alternative route. Save your home and/or your office address so that you can navigate straight there at the touch of just one button. Going off the beaten track? All you need is the geographical co-ordinate and Snooper S7000 Ventura Pro will take you straight there. Snooper's TMC service will alert you to all traffic incidents across the country and lists them in distance order from your current position. As well as this overview however you can also choose to monitor traffic incidents that are specific to the route you have programmed on the system. And, if there is congestion on your route you can simply ask Truckmate to automatically find a route around it. The Snooper S7000 Ventura Pro is integrated with Bluetooth technology for handsfree calling with compatible mobile phones. Also available as an optional extra is an extension microphone perfect for vehicles which generate a lot of background noise. The Snooper S7000 Ventura Pro like all Snooper sat nav systems, gets it speed camera data from the Snooper AURA speed camera database. The database provides advanced warnings to both fixed and mobile speed camera locations across the UK, Europe and in a growing number of other countries across the World. The database is constantly updated with the latest locations. Click here to read more about the AURA speed trap database. Snooper S7000 Ventura Pro mounts on the inside of your vehicles windscreen using the suction cup windscreen bracket provided. Snooper S7000 Ventura Pro can be powered directly either from its internal battery if it's fully charged or powered from the cigarette lighter socket. Snooper S7000 Ventura Pro works with NAVTEQ maps to provide detailed street level maps of 37 Western and Eastern European countries. Recognised as the industry leader in digital street level mapping, NAVTEQ maps provide high quality, detail rich maps. Ensuring you are taken seamlessly from A to B on the best possible route with full UK 7-digit postcode search. To ensure the most accurate postcode search available Snooper S7000 Ventura Pro uses Ordnance Survey, the most comprehensive of it's kind. The following countries are pre-installed on the Snooper S7000 Ventura Pro: UK, Ireland, France, Spain, Portugal, Italy, Austria, Switzerland, Belgium, Holland, Luxembourg, Germany, Denmark, Norway, Sweden, Finland, Poland, Estonia, Lithuania, Czech Republic, Latvia, Liechtenstein, Hungary, Romania, Slovakia, Slovenia, Serbia, Montenegro, Croatia, Turkey, Greece, Albania, Bosnia, Herzegovina, Bulgaria, F.Yugoslavia and Rep.of Macedonia. Snooper S7000 Ventura Pro provides advanced warning of all fixed speed cameras, SPECS and many laser sites using Snooper's AURA speed trap database. There are 3 easy ways to pay using a credit or debit card. To download and successfully update the Snooper S7000 Ventura Pro with software, sat nav map updates and/or speed camera locations via a computer you will need a PC running either Windows XP (32-Bit), Windows Vista (32-Bit), Windows Vista (64-Bit), Windows 7 (32-Bit), Windows 7 (64-Bit) or Windows 8 (64-Bit) with an internet connection. Please note: the S7000 Ventura Pro, as with all Snooper products, is not Apple MAC compatible. The Snooper S7000 Ventura Pro caravan/motorhome sat nav may now have been discontinued, however all of the accessories are available to buy from ActiveGPS. We sell replacement Snooper S7000 car chargers and external DVB-T antenna that came supplied as standard with the Snooper S7000 Ventura. Plus we also sell a range of extra parts including GPS antenna, carrying case and hardwire kit. Question: I have an old snooper ventura S7000 and my car charging lead has been lost, so I need a replacement. My question is what is the input voltage to the snooper or output voltage from the charger which is it 9vdc or 5vdc. Answer: I'm afraid we don’t know the answer to your question. We do however the sell the replacement car chargers, you can choose from either the new or original car charger via the S7000 car charger page. Do you have a question about the Snooper S7000 Ventura Pro? Submit your question via our contact page.